This article is about the Philippine province. For other uses, see Capiz (disambiguation). Capiz (Capiznon: Kapuoran nang Capiz; Hiligaynon: Kapuoran sang Capiz; Tagalog: Lalawigan ng Capiz) is a province located in the region of Western Visayas in the central section of the Philippines. 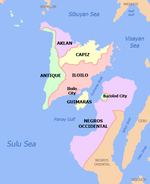 Its capital is the City of Roxas and is located at the northeastern portion of Panay Island, bordering Aklan to the north, Antique to the west, and Iloilo to the south. Capiz faces the Sibuyan Sea to the north. When the Spaniards led by Miguel López de Legazpi came to Panay from Cebu in 1569, after sailing from Mexico, they found people with tattoos, and so they called the island Isla de los Pintados. How the island itself came to be called Panay is uncertain. The Aeta (Negritos) called it Aninipay, after a plant that abounded in the island. Legend has it that López de Legazpi and his men, in search of food, exclaimed upon the island, pan hay en esta isla! "There is bread in this island"! and the island of Panay closely resembles the shape of a heart and the heart of Jesus Christ is considered present in the Eucharistic Bread. Panay is also an echo of Pannai, a constituent state in Srivijaya that housed an officially Buddhist Monastic-Army that defended the conflict prone strait of Malacca, the world's busiest maritime trade route for half a millennium and had successfully defended the territory against larger navies from giant countries like India, China and Indonesia before a treacherous and unexpected attack from the Chola occupied capital destroyed Srivijaya and sacked Pannai. Idealistic Datus and their most faithful soldiers who refuse to submit to foreign imperialism left the golden chains they had in Sumatra and migrated to Panay island to rebuild a society much truer to their ideals and had even achieved more democracy since they developed their initial Mandala (political model) even further, the original concept of the Mandala being a dynamic interaction sphere based of Tantric Cosmology and Political thought, with a definite center and the Datus of Panay then expounded on that tradition and decided to make the Mandala resistant to destruction by making it into a Kedatuan, establishing a Semi-democratic Hindu-Budhist influenced Confederation known as the Kedatuan of Madja-as where capitals and were routinely being transferred and different Datus took turns holding the crown. The Spanish then came and established their first settlement on the island at the mouth of the Banica River and called it Pan-ay. This was the second Spanish settlement in the Philippines, following San Miguel, Cebu. Unknown to many, Calle Revolución in Panay town is the second oldest street in the Philippines after Calle Colon in Cebu City, Central Visayas. The Panayanon's noble character and royal blood shone out in later centuries when fellow people from Panay island, at Iloilo City was given the Queen of the Spain, the Royal Title of "Most Loyal and Noble City" for being the most ardent and faithful city in the Spanish empire and had clung on to Spain while the entire empire collapsed. Although Capiz joined the Tagalog lead Philippine revolution, the Spaniards didn't surrender to the Tagalogs but they did surrender to the people of Iloilo and eventually Iloilo and Capiz were part of the same "Federal Republic of the Visayas" a substate which was formed within the First Philippine Republic, the first capital of which was in Cavite while the United States of America had betrayed the Philippine Revolution which they initially supported and in which, influential American officers swore loyalty to, by breaking their oaths and occupying Manila. In 1942, the province was occupied by Japanese troops and was later liberated by the joint Filipino and American troops with Capiznon guerrillas in 1945. Capiz and Aklan were united under one province until 25 April 1956, when President Ramon Magsaysay signed into law Republic Act 1414 separating the two entities. Capiz covers a total area of 2,594.64 square kilometres (1,001.80 sq mi) occupying the northeastern portion of Panay Island, and is one of the five provinces that compose the Western Visayas region. Mount Nangtud, is the highest mountain in Capiz with an elevation of 6,800 ft ( 2,073 m) located in the Capiz-Antique border. Other peaks are Mount Tigas 4,760 ft (1,451m), Mount Agudo 2,736 ft (834m). The province comprises 473 barangays, 16 municipalities and a city. Roxas City, the provincial capital, is only 45 minutes away by plane from Manila and is within the routes of major shipping lines. The Panay River used to be famous for the great number of crocodiles thriving there. Capiz is bounded by the Sibuyan Sea, the Panay, Loctugan and Ivisan rivers. Historians and ethnologists narrowed down to three types of people known to have inhabited Capiz: Atis/Aetas, popularly known as Negritos; Indonesian descendants of the Mundo tribe in central Panay; and the Malays. Roman Catholicism remains influential in the lives of most people living in Capiz especially in the fields of politics, education and even in their daily personal decisions. Roman Catholics are predominant with 70 percent adherence, the Iglesia Filipina Independiente has a strong minority with 20 percent while other minorities are Born Again Christians, Iglesia Ni Cristo, Methodists, The Church of Jesus Christ of Latter-day Saints, Baptists, Jehovah's Witnesses, and Seventh-day Adventists among others. There are two main local languages: Capiznon and Hiligaynon. Filipino and English are also used and understood as the business languages and are widely spoken as second languages respectively. Aklanon is spoken in towns near Aklan such as Sapian, Jamindan, and Mambusao. Capiznon is concentrated in the province of Capiz in the northeast of Panay. It is a member of the Visayan language family and the people using it are part of the wider Visayan ethnolinguistic group, who constitute the largest Filipino ethnolinguistic group. It is related but often confused with Hiligaynon/Ilonggo, yet it has its own unique vocabulary and accent, as well as a handful of words unique to the language itself. Broadcast media is catered by 4 radio stations namely: AM - DYJJ, DYOW - Bombo Radyo, DYVR - Radio Agong / RMN - FM.-Star FM, Love Radio, and Radyo Todo. Television facilities reach the city through Iloilo. However, we have two (2) cable television provided by Wesfardell Cable Services and the Filvision, Inc. (Altocable). An ABS-CBN Television relay station is now operating in the city. The province has a good hymn, Titled Capiz, it was the story of Kapitan Diego who was mandated by Legazpi. From Cebu, Diego sailed to Capiz and reach the shore of Culasi. And he met the pintados(people with Tattoos) then later on named it Capiz(Roxas City) As the capital of Pan-ay. But in 2006 theres a hymn actually won the contest. Titled O'Capiz. The primary transportation vehicle used in Roxas City and other municipalities in Capiz is the tricycle. Travel between municipalities is typically by jeepney, vans and Ceres operated buses. "Capiz Cab", the city's taxi that plies Roxas City and the 16 municipalities of the Capiz. Capiz Cabs are the first receipt-issuing taxis in the Philippines apart from those operating out of the Ninoy Aquino International Airport. Jocelyn Bolante, Politician who formerly served as an Undersecretary of the Department of Agriculture of the Philippines. Pedro Gil, was a physician, journalist, and legislator. He was elected representative for the south district of Manila on the Democratra party ticket. He became Minority Floor Leader in the House of Representatives of the Philippines. Manuel Roxas II, Philippine Senator, grandson of President Manuel Roxas and former Department of Interior and Local Government (Philippines) secretary. Antonio Trillanes, a retired Navy officer currently serving as a senator of the Philippines. Her mother is from Ivisan, Capiz. Mac Belo, basketball player. A son of a Capiznon from Pan-ay, Capiz who migrated to Cotabato. Jovita Fuentes, Dubbed the First Lady of Philippine Music. The first female recipient of the National Artist Award. Edu Manzano, actor, politician and endorser. His mother is from Roxas City. Luis Manzano, actor, host and endorser. His paternal grandmother is from Capiz. Jo Berry, actress, famous for her role as a mom with dwarfism on Onanay. Her mom is from Capiz. ^ "Welcome to Roxas City, Capiz, Philippines". www.roxascity.gov.ph. ^ "More tourists visiting Capiz". Retrieved 10 January 2014. ^ "Capiz now 109 years old". Philippine Information Agency. 14 April 2010. Retrieved 16 April 2010. ^ "Republic Act No. 1414 - An Act to Create the Province of Aklan". Chan Robles Virtual Law Library. Retrieved 14 December 2015. ^ a b c "Province: Capiz". PSGC Interactive. Quezon City, Philippines: Philippine Statistics Authority. Retrieved 8 January 2016. ^ "APINAN, Jeckster - PBA on INQUIRER.net". pba.inquirer.net. ^ Corp, ABS-CBN. "MEET THE BELOS: Mac and Dr. Vicki finally meet!". ABS-CBN SPORTS. ^ "Jose Maxian Captures The WBC Youth Championship". BoxingScene.com. ^ admin (12 February 2013). "Capiz's sports heroes remembered". ^ Cadiz, Gibbs (2013-05-13). "National Artist for Theater Daisy Avellana dies; 96". Philippine Daily Inquirer. Retrieved 2013-05-19. ^ "Jovita Fuentes was born in the town of Capiz February 15, 1895". The Kahimyang Project. ^ Sports, ABS-CBN. "MEET THE BELOS: Mac and Dr. Vicki finally meet!". ABS-CBN News. ^ "A". Women of History. Retrieved 6 January 2013.